The ladies of the Supreme Ventures Draw Team, dubbed ‘The Supremes’, strike a pose during the photo shoot for the SVL’s 2018 Meet the Supremes calendar. 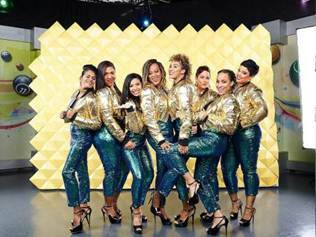 From left are Lisa McDonald, De’Andra Collinder, Peta-Gaye Sutherland, Kimone Reid, Jessica Campbell, Amanda Hudson, Olivia Nelson and Kerry-Ann Major. Supreme Ventures Limited (SVL) has launched its 2018 calendar, which features the ladies of the Draw Team. The launch took place at the Lotto Super Store in Clock Tower Plaza, Half-Way-Tree, recently. The ladies of the Supreme Ventures Draw Team, Kerry, D’Andra, Kimone, Amanda, Peta-Gaye, Lisa and Olivia, were stationed outside the location, signing calendars for excited patrons who came to collect their copy of the collectors’ item. The happenings were broadcast live on RJR 94 FM’s ‘Two Live Crew’ with popular personalities Action and the Burgerman. The glossy two-sided calendar, features ‘The Supremes’ decked out in gold lame jackets and turquoise-sequinned pants posing for the lens with a Cash Pot draw machine. Assistant vice-president of corporate communications Simone Clarke-Cooper says the motivation to produce a calendar was inspired by gamers’ love for the SVL Draw Team. “We haven’t done a calendar in two years, but customers have been asking for it. We realised the popularity of the ladies on the draw team while doing a series on social media and in print called ‘Meet the Supremes’. We got good feedback on the series so we thought that we should bring the calendar back this year and feature them,” she said. “Being on the ground was amazing. Players came out with such high energy and I was so happy to meet and interact with them. The photo shoot was awesome, too. It was another great opportunity to be with the other ladies and just be ourselves and have fun. I could do this more often,” she chuckled. Clarke Cooper says the calendars will be available islandwide next week and persons can pick up their copy at any Supreme Ventures regional offices while supplies last. Supreme Ventures has a total of seven regional offices islandwide: Cross Roads, St Andrew; St James Street, Montego Bay; Young Street, Spanish Town; Lyon’s Plaza, Savanna-la-Mar; McMaster’s Centre in Portmore; Island Shopping Plaza, Ocho Rios, and the Prize Payment Centre in New Kingston.